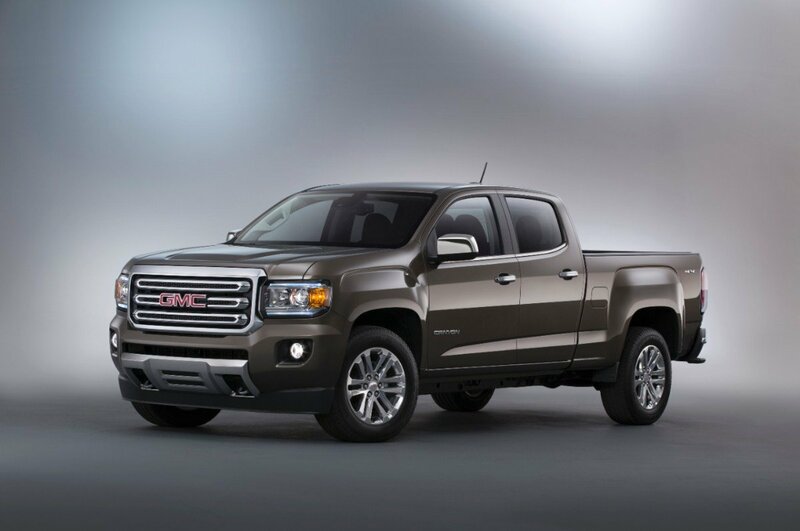 2015 GMC Canyon SLT crew cab with prices starting a $37,875 for a 4WD version. General Motors is clearly breathing new life into the mid-size truck segment with the announcement of its entry-level pricing for the 2015 GMC Canyon pickup truck which will be in dealerships this fall. The Chevrolet Colorado will be market available later in the cycle so no new details have been announced, but with the pricing revealed for the GMC version, it is possible that the Colorado could have a base price of about $20,000 based upon the Chevrolet-to-GMC pricing on other vehicles. The dominant players in this fit-in-your-garage truck category have been the Toyota Tacoma which is the market leader and the Nissan Frontier. Both are due for more-than-minor redesigns, and Nissan has been upfront about its proposed plan for a diesel version when a new vehicle is introduced. I suspect we will see them as 2016 models. Ford has declined to bring the Ranger to North America — the generally-accepted reason being its market strategy for the F-150, and there is no indication that Ram brand is planning to have a mid-size, probably for the same reason. In any case, if timing for a new mid-size pickup could be better, I don’t know how. It seems that the GM pricing strategy will work right along with it. The 2015 Canyon will start at $21,880 (including a $925 dealer freight charge. Standard equipment includes a 2.5L I-4 direct injected engine rated at 200 hp. Also on the basic model is LED lighting, four-way power driver’s seat, rear bumper with integrated corner step and 16-inch aluminum wheels. While GMC’s announcement is not specific, I suspect this is for a regular cab 2wd model with manual transmission which, of course, will represent a relatively small part of the sales. There will be a substantial number of upgraded models, as well, beginning with the SLE trim level. Prices jump quickly with a $27,520 tag attached to the 2wd extended cab version, and a 4wd Canyon SLT crew cab with a short box starting at $37,875. At the SLE trim level and above, Canyon owners will get aluminum interior trim, soft-touch instrument panel and door pads, EZ-lift and lower tailgate, 8-inch diagonal color-touch radio with Intellilink and OnStar LTE with a 3-month trial. As you get up into the SLT crew cab, the standard is the 3.6L engine with 305-hp20th. This is leather-trimmed seating, automatic climate control, 18-inch polished cast-aluminum wheels, remote start and an automatic locking rear differential. No tow capability information has been released and I expect that it will be available along with EPA-fuel economy numbers and expanded pricing information. I have seen the 2015 Canyon and can assure anyone with an interest in one that it is stylish and attractive both inside and out. Clearly,it has the prestige of the GMC brand and I believe that there will be a Denali edition as part of the offering. As with all pickups, there is an almost unlimited number of configurations and options. These will include the upgraded engine, a six-speed automatic transmission, Bose premium seven-speaker audio system and the GearOn accessory system which helps to organize the transport of bicycles, kayaks and other equipment. The General Motors warranty for the new Canyon has two years (or 24,000 miles) of standard scheduled maintenance, along with a five-year/100,000 mile powertrain warranty and three-year/36,000 mile bumper-to-bumper warranty.